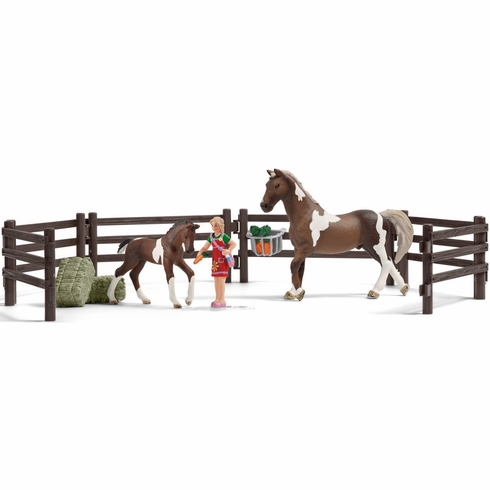 Set contains: 1 x Trakehner stallion, 1 x Trakehner foal, 1 x girl, 2 x hay, 2 x carrot, 6 x paddock, 1 x feeding rack. New Play set from Schleich! Each horse has its own favorite food. Some prefer crisp apples, others fresh hay or hard bread. Our little Trakehner has the same taste as its father; it loves to feed on carrots. When its friend comes to see it in the morning in the stable, it already scrapes excited with its hooves, because in most cases she brings treats with her. As she tenderly caresses its head, the little one eats the carrots greedily from her hand. Then it can soon go out to the paddock, where it plays with its two friends around its father. Perfect gift or starter set!